Imagine that you’re in Florence, looking at awe-inspiring, breathtaking works of art. If you suddenly start to feel that you literally cannot breathe, you may be experiencing Stendhal Syndrome. A psychosomatic disorder, Stendhal Syndrome causes rapid heartbeat, dizziness, sweating, disorientation, fainting, and confusion when someone is looking at artwork with which he or she deeply emotionally connects. Also called Florence Syndrome, Stendhal Syndrome is similar to Paris Syndrome, in which tourists who visit Paris for the first time experience anxiety, dizziness, tachycardia, hallucinations, or delusions after they realize that Paris is drastically different from the idealized city they thought it would be. Another extreme form of culture shock is Jerusalem Syndrome, in which tourists suffer from obsessive religious thoughts and delusions in the holy city of Jerusalem. Stendhal Syndrome is not merely a modern phenomenon or #FirstWorldProblem. In 1817, a French author named Marie-Henri Beyle described his experience visiting the Basilica of Santa Croce in Florence. Beyle, who wrote using the pseudonym Stendhal, felt overwhelmed by all the beauty and rich history surrounding him: The Basilica featured magnificent frescoes created by the Italian Renaissance artist Giotto, and it was where Machiavelli, Michelangelo, and Galileo were buried. Emotionally, he felt inspired by the sublime beauty, but physically, he experienced heart palpitations and weak, shaky legs. Over a century later, visitors to Florence continued to suffer from similar symptoms. In 1979, Dr. Graziella Magherini worked as the Chief of Psychiatry at the Hospital of Santa Maria Nuova in Florence. After observing more than 100 tourists who were hospitalized after looking at art in Florence, she coined the term Stendhal Syndrome. In 1989, she published a book, La Sindrome di Stendhal, about these tourists, who experienced a range of symptoms that included anxiety, panic attacks, hallucinations, and even psychotic episodes—all after seeing renowned artwork. Describing the patients she observed, Magherini said they were sensitive, emotional people who essentially "overdosed" on art. Because Florence has so much famous artwork on display, tourists tend to squeeze in as much art as they can in a few days. Victims are typically impressionable, single people between 26 and 40 years old, who are stressed by travel and may be struggling with jet lag. Of the people she studied who were hospitalized, about half had prior treatment for mental illness—although "prior treatment" could simply mean that someone attended weekly therapy sessions. So why Florence? Some cases of Stendhal Syndrome have occurred in other Italian cities with stunning artwork, but Magherini says that Florence is the locus because it has the most Renaissance art, which is superficially beautiful and recognizable but often contains darker, disturbing details. Magherini notes that art can provoke subconscious feelings and memories in sensitive viewers. After a few days of rest, or better yet, leaving Italy and resuming their normal lives, patients usually recover fully. Stendhal Syndrome does not currently appear in the American Psychiatric Association’s DSM (Diagnostic and Statistical Manual of Mental Disorders). 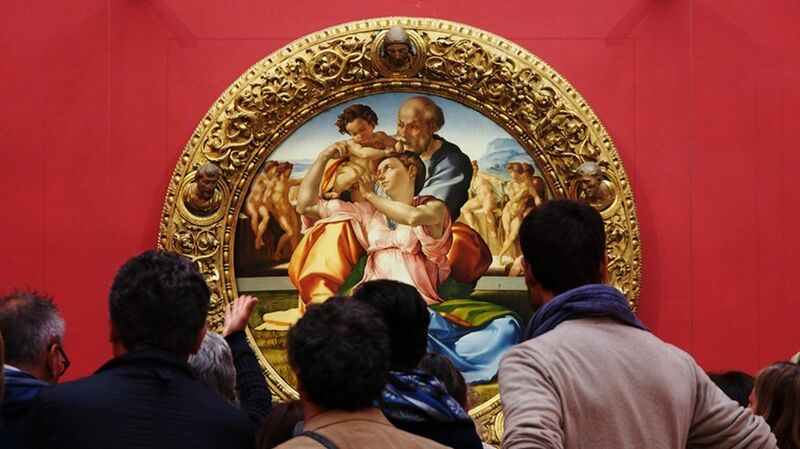 Psychiatrists have, however, documented the syndrome in medical journals and advise that tourists pace themselves in art museums and get enough rest in between viewings of Italy’s breathtaking, powerful masterpieces. Bonus trivia: A 1996 Italian horror movie called La Sindrome Di Stendhal was about a serial killer who kidnaps a woman who is experiencing Stendhal Syndrome at a museum. The film’s writer and director, Dario Argento, was inspired by his own intense experience with Stendhal Syndrome as a child while visiting the Parthenon with his parents.